Pandora - ZineWiki - the history and culture of zines, independent media and the small press. 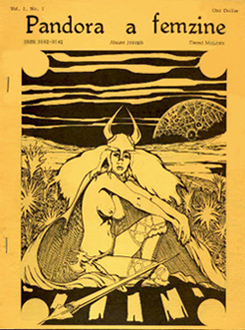 Pandora was a small press publication devoted to fantasy and science fiction published by Lois Wickstrom, Jean Lorrah and Meg MacDonald. Pandora was published from 1978 till 1993. Twenty nine issues appeared in that time. It was founded and edited by Lois Wickstrom in Denver, Colorado, U.S.A., from the first issue published October 1978 to issue 9, released September 1982. The publication was then assumed by Jean Lorrah (who had been associate editor on issues #8 and #9) in Murray, Kentucky, from #10 (Summer 1983) to #17 (Fall 1987), serving as co-editor with Wickstrom. Publication was then taken over by Meg MacDonald (who had been associate editor on issues #16 and #17) who became sole editor from #18 (Winter 1988) to the final issue, #29, released Spring 1992. For the first two issues the publication was titled Pandora a femzine. The motto for issue 2 reads, "If Pandora hadn't been curious, there would be nothing to write about". The mandate of the zine was to raise awareness of women's writing. After that, the title changed to Pandora: role expanding science fiction and fantasy till issue 9, after which it was simply Pandora. Contributors of cover artwork included Barb Armata (#15), and Diane Webber (#11). Interior artwork was by Barb Armata, Brad W. Foster, Jan Sherrell Gephardt, Beckett Gladney, Vance Kirkland, J.S. Orozco, Victoria Poyser, Eileen Rosen, Marge B. Simon (Star*Line), Tim Standish, Polly Vedder, Cynthia Weinberg, and others. Contributors of poetry included Ray Bradbury (Futuria Fantasia), Tom Disch, Roger Dutcher (The Magazine of Speculative Poetry), Robert Frazier (Star*Line), Margaret Palmer Gordon-Espe, Scott E. Green, Sandra J. Lindow, Ardath Mayhar, A. McA. Miller, Edward Mycue, Peter Payack, Wendy Rathbone, Tom Rentz, Ted Reynolds, Ruth Roston, Ann K. Schwader, Daryl Scroggins, W. Gregory Stewart, Elizabeth Thomas, Burn Thompson, Laura Gould Vargas, Ree Young, and others. Steve Rasnic Tem (Umbral) was the poetry editor for issue #11. Contributors of writing included Piers Anthony, Margaret Barnes, Nina Boal, Jayge Carr, Paul Dellinger, Terry D. England, Janet Fox (Scavenger's Newsletter), Janrae Frank, Heather Gladney, Lisa Goldstein, Peny R. Griffin, Susan Holtzer, Stephanie Hoppe, Phyllis Ann Karr (The Literary Magazine of Fantasy and Terror), Connie Kidwell, Jean Kilczer, Jacqueline Lichtenberg, Brad Linaweaver, Jean Lorrah, Patricia Matthews, Theresa McGarry, Resa Nelson, Richard J. Reed, Mark Rich (Treaders of Starlight), Ralph Roberts, Deborah Sears, Marge B. Simon, Al Sirois, Warren Sitka, Fran Skene (Love Makes The World Go Awry, BCSFAzine), Tais Teng, Wendy Wheeler, Thomas Wiloch, Lili Winkler, and others. This page was last modified on 19 October 2017, at 16:46. This page has been accessed 6,927 times.